This luxury 2 bedroom apartment is ideally located on Clare Island with our blue flag beach on its front door step. This offers a safe swimming and snorkelling area, with an opportunity to take part in other activities (Sea Kayaking/Rock Climbing/ Absailing / Coastering ) organised through Adventure West with prior arrangement. . Also fishing, diving and boat sight seeing trips may be arranged at your time of booking. Ideal landscape for amateur/professional photography or for that keen bird watcher. There are several great walking trails with guided walks to include history and geology of the island. With all this in mind Clare island is still a very tranquil setting. Nothing more relaxing than waking up to the sound of the waves crashing on the beach. 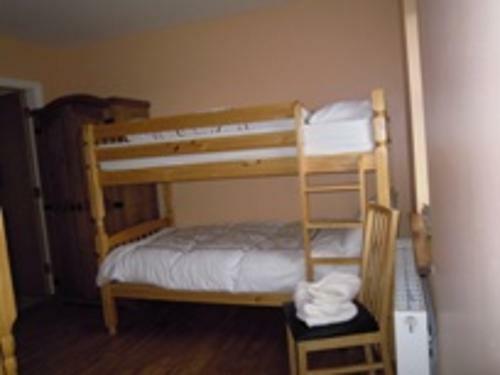 Both bedrooms are en suite with bed linen, towels, extra bed and travel cot provided, also iron/ironing board and hair dryer. The first floor is Kitchen/Dining/Sitting area combined, open plan with 6 large velux windows giving it a bright airy feel. All mod cons included Fridge/freezer, Cooker/oven, Stereo, TV, Wi fi, Microwave, Kettle, Toaster and washing machine. Central heating is included in the rental fee. Refuse bags are available to buy in the local store but can be provided by owner. Meter reading is in place for electricity. Nearest beach is across the road. Access to this property is by car.